Today: You have the power to bring the best out of dark leafy greens. Wondering what to do with that bunch of greens sitting in your crisper? You can take the same freestyle, compositional approach you use when making a salad, while softening a bit of the greens' earthy and bitter flavors -- just sauté. 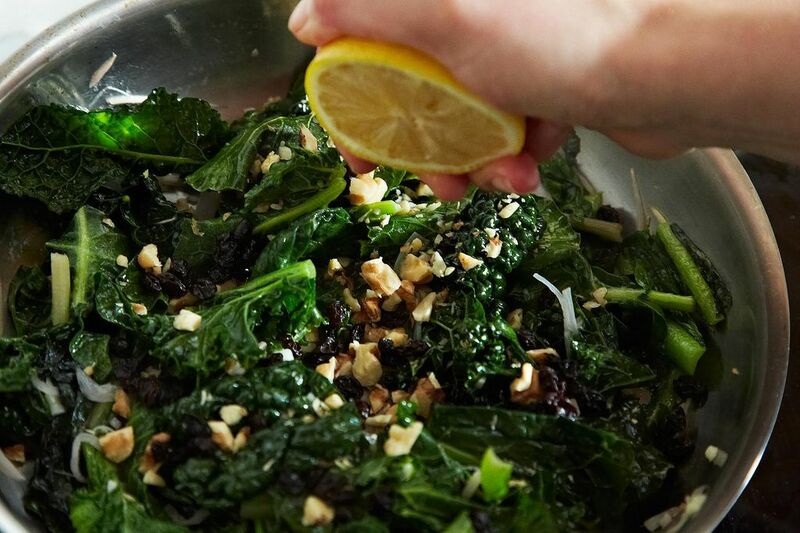 Unlike salads, maybe not everything goes well in sautéed greens; so follow our lead for the right ratios of fruit, nuts, and acid to create a no-brainer, non-threatening side dish, and -- with the right ingredients -- even a main. As a bonus, taking what seems to be too big a batch of greens and shrinking it down to a manageable quantity can be surprisingly empowering, as satisfying as giving kale a deep tissue massage during salad prep. Try this method with a mix of greens and add-ins -- you have the power. 1. Wash greens thoroughly. (Here's our favorite way, no salad spinner required.) Here we used mustard, lacinato and curly kale, Swiss chard, and a few baby collards. 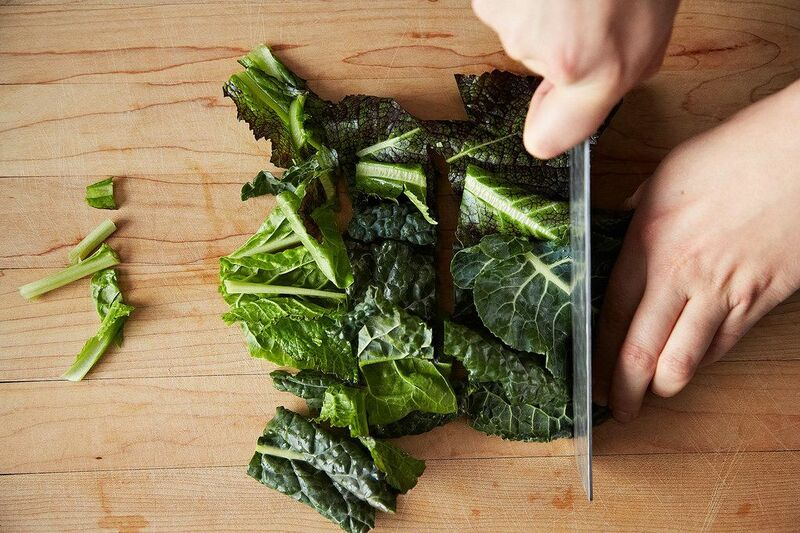 Prep will vary depending on the type of greens you select -- for younger greens like mustard or turnip, simply trim the ends off, but kale or chard may need de-ribbing. 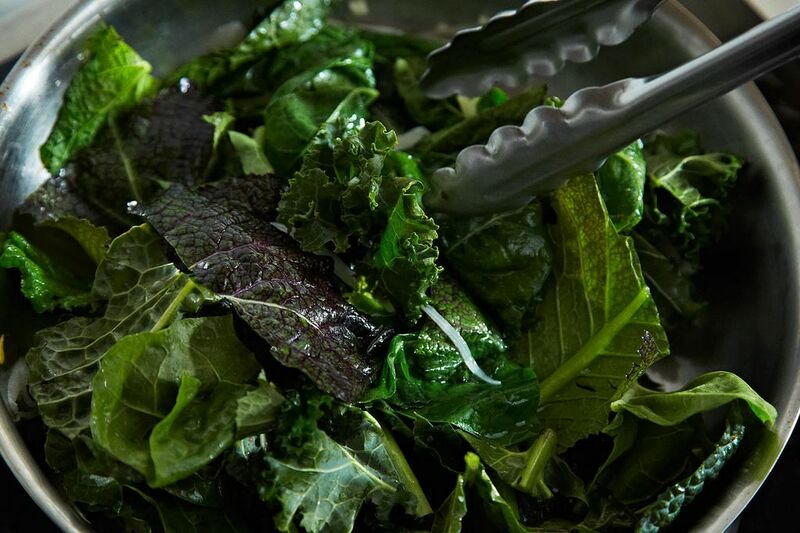 More: See how we prep kale, from washing to de-ribbing to (optional) massaging. 2. 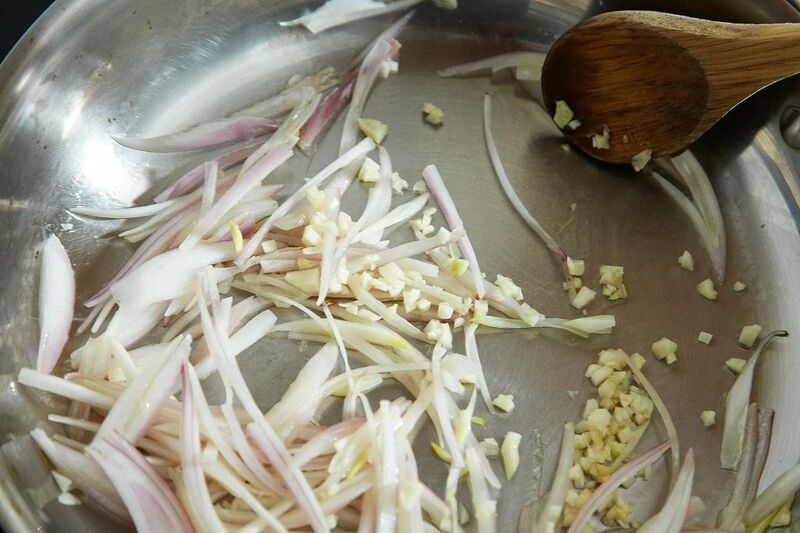 Add a healthy amount of oil to a sauté pan over medium heat, about two tablespoons for larger bunches of greens. Warm the pan and, once the oil is hot, toss in chopped or sliced alliums (here we used sliced shallots and minced garlic), and allow them cook just before the point of browning. 3. Start adding the greens in batches -- the pan should be borderline full but not overflowing. Once the greens start cooking down, continue to add more. A good trick for speeding the cooking process and softening the greens, without adding additional oil, is to spoon a few tablespoons of water or broth into the pan, allowing for a nice partial steam. 4. Now it's time to embellish. Add acid, like the juice from half a lemon or a spoonful of vinegar (sherry, red wine, apple cider). Throw in a handful of toasted nuts, or a small handful of dried fruit. 5. Serve as a side, throw in some protein at the last minute, or toss in pasta for a meal. Instead of water/broth, I use orange juice, especially with chard, or apple cider and then add vinegar or lemon to balance sweetness. Also good with sautéed red pepper and the poach an egg or two on top. 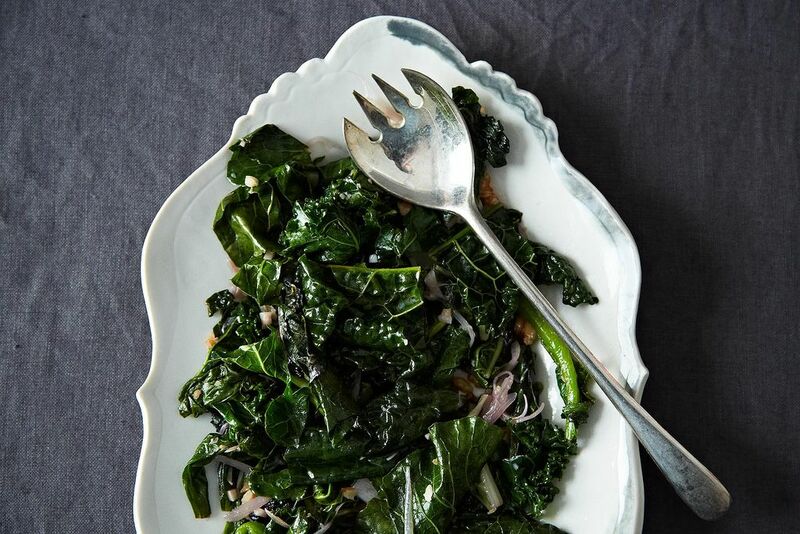 We saute kale, chard, and other coarse greens like these all season long. Other great additions are chile peppers, smoked paprika, potatoes, cannelini beans (or whatever beans you have on hand). Great Italian cucina povera! Forgot to mention - that virtuosity is somewhat tempered by the addition of the local foodie family grocery chain, "Farm Boy," 's Garlic Mayonnaise. But only slightly. Apologies for the lack of grammuh. I chop the kale fairly small - probably 1-2" wide - and leave the stems on when roasting, as we feel it makes us even more virtuous, eating a healthy vegetable that has some real crunch at its core! Another great way I discovered is to bake the greens (like kale - the stalks of which have been removed) then break up into smaller pieces and place on a tinfoil lined roasting pan. I added sliced up yams, small chunks of cauliflower and some small mushrooms. Sprinkle with salt and peeper and drizzle with olive oil, pasting some of the oil onto the mushrooms etc. Place fairly high in oven at 350-375 degrees for about 30 mins. Keep a check on the kale as it can crisp up if left too long. Test with a fork for veggie readiness. Delicious done this way as the full flavor comes through this way! Whoa that sounds good. I might try that tomorrow! I'll try both of these recipes, cooking greens can be hard for me! Wondered what to do with my bunch of kale for tonight. I have all the ingredients to sauté and will do so. Thanks so much. This is such a nice idea to remember when your greens get ahead of you! Sliced radishes also sauté into a delicious addition! Love this website and all the great contributors!